Still wearing my Rebecca Minkoff swing bag! I really wanted to pair it with the purple maxi dress at least once. Thought the colours worked nicely together. It's gotten much warmer all of a sudden, despite winter being just a week away, so bright colours seemed a good outfit to wear on hot Sunday. The purples and pinks in the scarf go so well with the dress too, looks like they were made to be paired together, don't you think? Last worn: havana maxi dress, Louis Vuitton bandeau, Havaianas, Rebecca Minkoff yellow Swing bag. Much more casual outfit today (although still with the same bag...) as I wanted to be comfortable out and about doing the grocery shopping I didn't get to do on Sunday as DH had a work event. Again, was warm enough to go sleeveless and not worry about adding any extra layers. Really doesn't feel like the end of Autumn! Don't think I've ever paired orange and yellow together before - but I liked it. It was funny to come across Wilfully Elegant's latest post today where she paired the same colours together too. Must be the warm weather we are both experiencing, or the fact that great minds think alike! 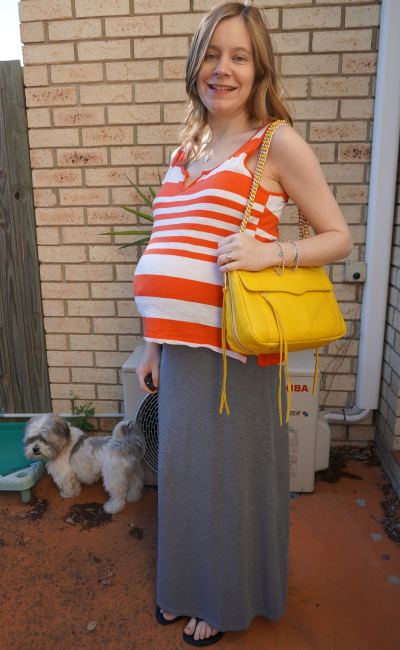 Last worn: Jeanswest orange stripe tank, Target grey maxi skirt, Havaianas (see above), Rebecca Minkoff Swing (see above). Linking up with Manic Monday, Real Mom Style, Style Sessions, WIWW, Wardrobe Wednesday, Trend Spin Linkup, Stylish Tuesday, Colour Brigade today. The yellow handbag is beautiful! great looks! I really like the yellow and purple together! That's a fun color combo! I honestly thought that scarf was part of the dress at first. Haha, they were meant to go together! 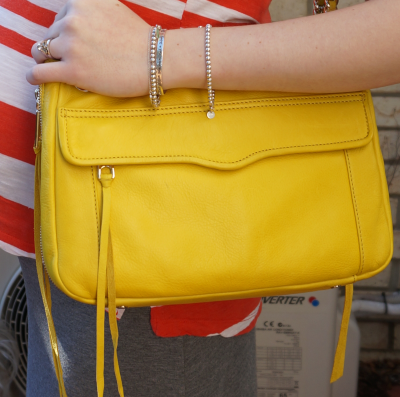 Love the yellow Rebecca Minkoff! The bag does look great with the dress! Your belleh is massive. I'm getting very excited for you! It is! Not long until baby's due date now! That purple and yellow are so striking together! Very pretty Mica! That yellow bag is adorable ! I have to say that the purple dress in your first outfit suits you very well! Love the purple and yellow together! t's fun to see the bag worn short and long in the same post. Adorable as always. Yellow and purple hues makes great color combination! Love the bag too! I love your color combinations in both outfits! I love the pop of color with both outfits. Very cute. You and cooper are looking as cute as ever! I love your yellow bag! Such a great bag, the yellow just pops out - love it! Yellow + orange together are nice, too. can't believe winter is only one week away for you! i need to move to australia. :) i really like the orange & yellow brights together. look at your baby bump!! yes, but move here when it's summer, much nicer! haha! I love Rebecca Minkoff...both looks are great. Especially your accessories! PS. I'm getting anxious for you! I can't wait to see your little one!! I'm so excited to meet him or her too! :D Can't wait, not long until due date! love this RM bag and purple/yellow is one of my fave combinations! i love the purple & yellow!! and that scarf literally looks like it's a part of your dress! and seriously, your puppy-- the cutest!! 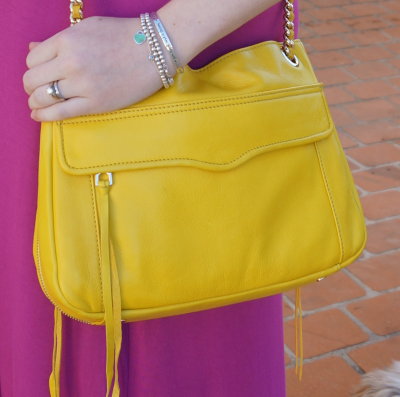 love that yellow purse... it complements your purple dress really well! winter is next week for you? i keep forgetting on your side of the world we are completely on the opposite! it's getting really hot here in california! I really like the top look. Prefect for spring. Love the bag too babes! that bag, so gorgeous and i love the color for summer and with that purple maxi! the ruffle details on your dress are also the cutest. Absolutely in love with the magenta maxi!! You look beyond gorgeous! !